Friday Night Basketball Action DSU vs. Dickinson! 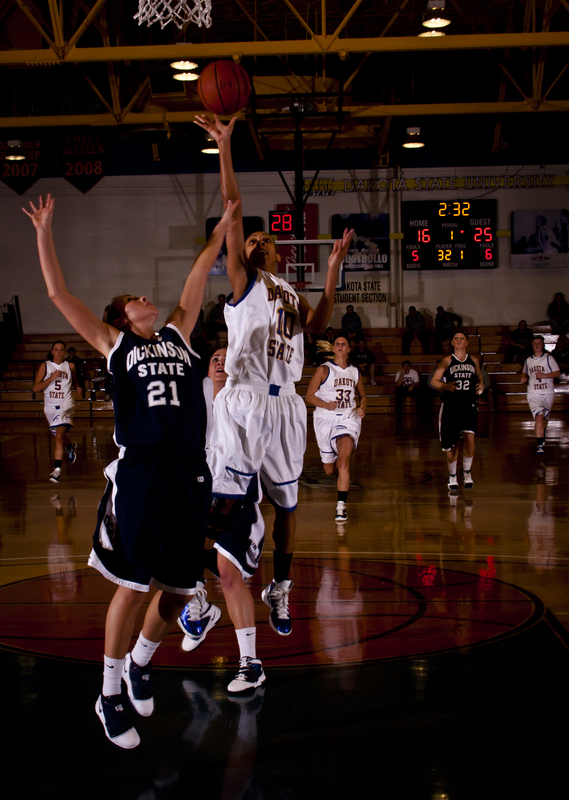 The Dakota State women’s basketball team took on Dickinson State Friday night in Madison. 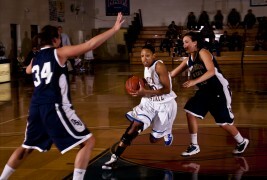 The women’s team hung around with the blue hawks, but fell short after a last minute comeback effort. The Lady Trojans lost with a score of 58 to 54. This loss dropped the Lady T’s to 5-16 overall and 1-8 in the conference. Aneshia Starks goes in for a tough shot again a Dickinson State player. Photo by Rebecca Ziegler. The blue hawks came out and took the lead fast within the first three minutes of the game. The Trojans battled back to cut the lead down about halfway through the first half. Right before the end of the first half the Trojans had a hard time scoring getting limited to 4 points. The start of the second half the Trojans fell into a slump falling into a 34-19 deficit. Halfway through the second half the Trojans got hot and went on a 23 to 10 scoring run to cut the lead to one points with 49 seconds left. 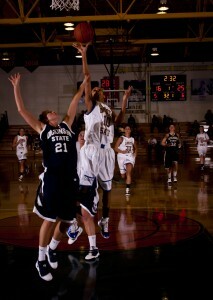 In the end the Lady Trojans could not capitalize on their scoring opportunities to put the blue hawks away. The men’s team extended their win streak to 4 games Friday after the women’s game concluded. 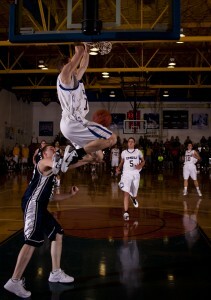 The Trojans defeated the blue hawks with a score of 68-49. This win moved the men’s record to 13-10 overall and 4-5 in the conference. Dickinson State came out cold at the start of the game missing their first ten shots of the game. The Trojans took advantage of this grabbing an early lead. That lead was cut down after Dickinson started knocking down some shots. The Trojans got hot once more and took the lead into halftime with a score of 35 to 21. After the second half, the blue hawks battled back to give the Trojans a brief scare, but with DSU’s improved defense and a dominating performance from Santino Clay. Dickinson could not keep up with the Trojans. Santino Clay put the team on his back and had a career high scoring night with 30 points. He was 10-12 from the field and shot an unbelievable 8-9 from the arc. Bryce Snyder added to Clay’s performance by scoring 7 points and pulling down 8 rebounds. The Trojans will look to continue their hot streak and go for five wins in a row against Minot State. DSU men's team showcases their dunking skills at Friday's game against Dickinson State University. Photo by Rebecca Ziegler. Trojans and Lady T’s Bash the Beavers!